With the EoL deadline for Windows Server 2003 fast approaching, decisions over operating system upgrades and in particular, whether or not to stick with Microsoft Exchange, are currently high up on the agenda for many small businesses. For alternatives to Exchange such as MDaemon Messaging Server (voted number one alternative by ‘Spiceheads’) now is the time to shine. With that in mind, we’re running a flash sale for one month to give you a wee incentive to take a look at MDaemon for yourself and to download the free 30-day trial. 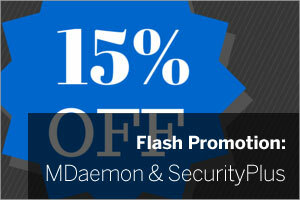 Over the next four weeks (offer ends June 30th 2015), if you purchase either a new MDaemon licence, or a new SecurityPlus licence, you’ll receive an additional 20% discount off the already highly competitive RRP price. This offer applies to partner program members but please note this doesn’t include renewals of existing licences, or the Outlook Connector and ActiveSync plug-ins. If you visit the web site you’ll see the listed prices remain the same, however during the promotional period, the discount will be automatically applied when you add items to your shopping basket. For any questions around pricing or how to claim, please don’t hesitate to get in touch. MDaemon is a true alternative to Exchange for small businesses. Download the fully functional trial and test the Outlook integration, mobile device synchronisation, webmail, spam and virus protection and lots of other nifty features such as ticketing, document sharing and more. Prefer a look around first? This video is a great place to start and is a recorded webinar where technical lead Neil Perry provides a walk through of the main features and interface.